I was in a bit of a panic yesterday because I went to the supermarket to pick out a turkey and was greatly disappointed in the quality and selection at our local store. I'd been meaning for weeks to order a heritage turkey but time got away from me and here I was, two days before Thanksgiving without a turkey. I even had a backup plan for last weekend and that didn't even pan out. Evidently there are places in Santa Ana where the customer can pick out their turkey from live birds kept in cages. But I dropped the ball on that one too. Bad news. I was retelling my plight at lunch today, including the bit about the Santa Ana butchers, when one of my coworkers told me that his brother in law owned a butcher shop. He called up Khaled (the brother-in-law) and asked if he had turkeys. Sure enough, he had some left. I talked to him later this afternoon and Khaled promised to pick out a good one for me and have it ready when I arrived. Turns out, Khaled owns one of those pick-your-bird shops, except his is in Midway City. It was a bit strange walking into a store and looking at animals in cages and then being handed a dead bird that had expired only a few minutes earlier. Mine was still warm. Thankfully, my bird was already dead before I arrived, which did not require me to actually "pick" it out from the crowd. It was a bit of a strange experience but on the whole, it was rather positive. It is a small family owned business, the meat is incredibly fresh, and the turkey only dies when there is a demand. 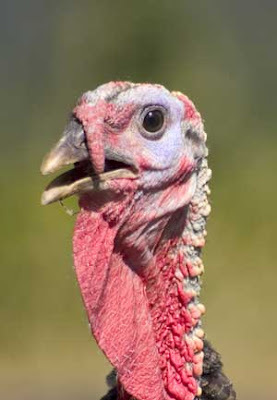 I can't help but think about all those butterball turkeys that languish in the supermarket after Thanksgiving. So yeah, that was my somewhat weird but oddly positive thanksgiving turkey story. Wow! if you are going to eat meat that sure sounds like the way to do it. I don't think we have those kind of butcher shops up here. Happy Thanksgiving! I agree, that's quite interesting and cool. I hope it was a tasty bird!